A comic parody of 1930s-style gangster films, Johnny Dangerously tries hard but misses most of its targets. Johnny Kelly (Michael Keaton) now operates a pet store. He catches a would-be young thief in the act, sits him down and explains that crime does not pay by recounting his life story. Johnny was brought up on the street corners of New York City, and his Ma (Maureen Stapleton) was perpetually sick and in need of expensive surgical procedures. To secure the money Johnny drifted into a life of crime and joined the gang of Jocko Dundee (Peter Boyle), saving Jocko's life in a gunfight with the rival gang of Roman Moronie (Richard Dimitri). Johnny adopts the flashy surname of Dangerously and rises through the ranks to become Jocko's second in command while fending off the threat of long-time rival Danny Vermin (Joe Piscopo). He meets and marries showgirl Lil Sheridan (Marilu Henner), and helps his brother Tommy (Griffin Dunne) get an education as a lawyer. Jocko and Johnny have the law in control by keeping District Attorney Burr (Danny DeVito) on the payroll, but trouble arrives when Tommy graduates and embarks on an anti-crime career, setting himself on a collision course with his brother. Directed by Amy Heckerling and written by a clumsy committee of four, Johnny Dangerously is only occasionally funny. Heckerling and Keaton were coming off successful but small films in the form of Fast Times At Ridgemont High and Mr. Mom respectively, and perhaps bit off more than they were ready to chew. 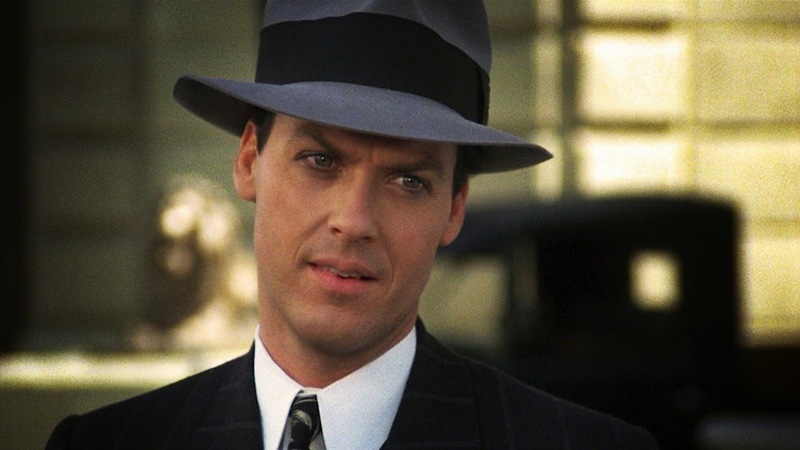 Despite a barrage of jokes and visual gags, Johnny Dangerously sets the sophistication bar quite low, and most of the humour is ho-hum at best. Making matters worse, the set design is just too slick, giving the film an inappropriate polished and theatrical shine, while the central performances of Keaton, Boyle, Henner, and Piscopo stop just short of winking at the audience and shouting to the rafters. The better moments come from secondary sources. Gang boss Moronie is an expert at mangling the English language and draws the best laughs with some classic sputtered lines, while Burr's quietly frantic and ultimately fruitless attempts at controlling Tommy make best use of DeVito's talents. And when Johnny calls on the services of a priest on the way to a possible date with the electric chair, the priest's supposedly Latin ramblings are simply priceless. Roman Moroni, testifying at a congressional-style hearing: I would like to direct this to the distinguished members of the panel: You lousy cork-soakers. You have violated my farging rights. Dis somanumbatching country was founded so that the liberties of common patriotic citizens like me could not be taken away by a bunch of fargin iceholes... like yourselves. The rest of the film is conspicuously forgettable, and features too many obvious repetitions of jokes that run out of steam early but are anyway mercilessly re-deployed. Despite a smattering of good intentions, Johnny is neither on the spot nor in the least bit dangerous.